ATLANTA, March 26, 2019 /PRNewswire/ -- InComm, a leading payments technology company, today announced it has partnered with WH Smith, a leading global retailer for travelling consumers, to bring dedicated shopping hubs for prepaid gaming products to WH Smith stores in the UK as well as the greeting card e-commerce website, FunkyPigeon.com. InComm will supply a wide selection of prepaid game cards for popular online, console and mobile gaming platforms that will be available for purchase at dedicated store sections within WH Smith retail locations. 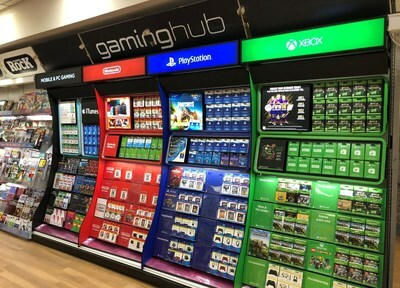 This partnership extends to FunkyPigeon.com, a website owned by WH Smith, which will now provide shoppers the option to buy a digital code for Xbox One games and services with the purchase of an online greeting card. "We have seen a growing number of consumers in recent years purchase gift cards and other prepaid products for their own use, particularly as it relates to gaming," said Simon Osgood, SVP InComm EMEA and Russia. "There are several reasons why consumers are purchasing gaming cards for their own use, such as convenience and the ability to buy items without having to connect their credit card to an online account. As the premier retail destination for on-the-go consumers in the UK, WH Smith is the ideal partner to reach gamers looking for a convenient way to purchase their favorite games." This partnership is the latest in a series of prepaid product launches that InComm has supported in the UK. Since entering the market in 2006, the company has collaborated with some of the country's largest retailers to bring a more convenient payment experience to consumers.